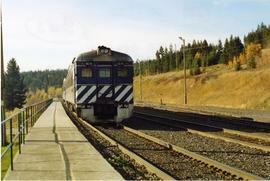 Photograph depicts a southbound passenger of 2 Budd cars approaching the Exeter station in 100 Mile House. Davies notes that the shot is important because it was the first time traffic ceased on all PGR/BC Rail lines on October 31, 2002. 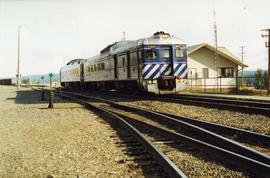 Photograph depicts a southbound passenger tain pulling into the Exeter Station of the BCR. 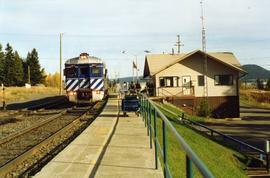 Photograph depicts a departing southbound train. Here, in another 20 days from the time the picture was taken, all passenger traffic would cease. It had never happened in the 80 year old history of the PGE/BCR. 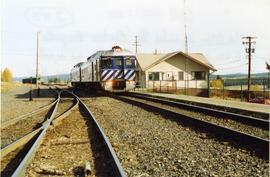 Photograph depicts a BC Rail passenger train that had stopped to let passengers board at Exeter Station. Jobs were being lost as a result of the cessation in passenger traffic. 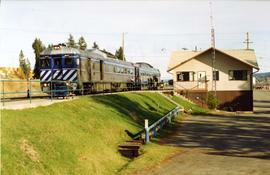 Photograph depicts 2 Budd cars of a departing southbound train. 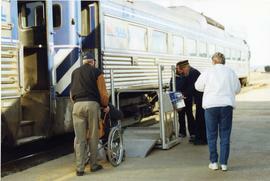 Photograph depicts the rear of a train where disabled passengers are elevated to door level. This was a coach Budd car. 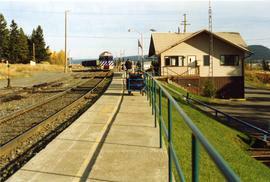 Photograph depicts the Exeter station of the BC Rail which had a hand-cranked elevator for wheelchair passengers. 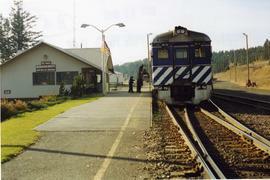 Visible is the view of a Budd coach #15, which was probably almost 50 years, but still looked modern. 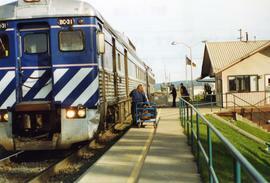 Photograph depicts a three times weekly southbound train.